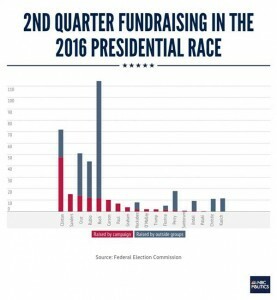 With the deadline in the books for campaigns to report how much money they raised between April and the end of June, there’s now a clearer picture of which candidates are dominating in the money race. And while the deadline for outside groups to report their totals isn’t until the end of the month, many groups have made the size of their war chests public as well. One headline: The 2016 campaigns and their associated outside groups have raised at least $385 million in the second quarter fundraising period. But at least two-thirds of that haul came from super PACs and other outside groups that can solicit unlimited donations. And Super PACs and outside groups are playing an even bigger role in the Republican race, with nearly four in five dollars raised in GOP contest going to these outside groups ($229 million), versus the campaigns ($66 million). But when super PACs and 501(c)4 groups are added to the equation, one candidate is dominating the boards. Jeb Bush’s superPAC, Right to Rise, announced that it brought in $103 million. Cruz’s series of outside groups, Keep the Promise, posted an estimated $37 million haul, while a pair of pro-Rubio groups raised almost $32 million.